Who doesn’t love a good accent? British, Indian, French, Spanish, Irish, Australian, South African, and Japanese actors, among many others, all bring added spice to their roles on the American big screen. And I suspect the same holds true in reverse (when I visited Australia several years ago, someone told me she loved my accent, which was a total mindbender for me). Exotic settings and unusual characters are one of a writer’s most enjoyable opportunities in fiction—and sometimes these opportunities will allow our characters to speak in foreign languages, dialects, or accents. Were you able to read that dialogue at a glance, or did you have to stop and sound out each word? Even then, you might have been left guessing a time or two. When we interrupt our readers’ experience of our story and force them to think about the way the words are put together, we’re just asking for their suspension of disbelief bubble to pop. Do these characters come across as fascinating—or just cartoonish? By forcing readers’ attention onto the pronunciation rather than the words themselves, we’re robbing our characters of their personal power. Is it the way they say their words that makes them great characters—or is it the words themselves? Should you happen to be intimately acquainted with Scottish or French speakers, I’m going to guess you probably snorted your coffee as you rightfully determined that my knowledge of these accents only stretches as far as my film-going acquaintance with Gerard Butler and Marion Cotillard. You can’t fake mastery of a dialect on paper anymore than you can in real life. All of the above contribute to a general sense of reader distraction. If readers are too busy trying to decipher your dialogue, laughing at your characters’ silly speeches, or rolling their eyes at your less-than-perfect grasp of the dialect, they’re not going to be thinking about how awesome your story is. Readers are smart. They don’t need much encouragement to get the idea that your character talks like Jackie Chan or Helen Mirren. Sometimes just mentioning your character’s nationality will be enough to help readers hear the proper accent when reading your dialogue. Rely on the rhythm of the language. An accent is just as much about interesting rhythms and phrases as it is the actual tilt it brings to the words themselves. Let your character’s interesting word choices or incorrect sentence constructions carry the burden of conveying the foreignness of his speech. Use the occasional phonetic misspelling. One or two phonetic misspellings aren’t likely to trip readers up. But go sparingly. You’re not going to want to get much more radical than leavin’ off a “g” here and there. The reason some authors are so adamantly attached to the idea of presenting dialect syllable by syllable is that they love their character and they love that their character speaks with an accent and they want readers to love that character just as much for just the same reasons. But—and trust me on this—if you’ve done your job right, readers will love your character just as much with or without the accent. In fact, if the accent is done poorly, they’ll definitely love him much more without it. The Scotsman stomped into the room and smacked his claymore onto the table. “I did not ask for my dinner to be ten minutes late, now did I, my wicked lassie? Now wasn’t that much easier to read? Didn’t the characters come across more clearly? And didn’t you still get the gist that the characters were foreign (both because the narrative told you they were and because each line of dialogue included a dialect-specific word)? Trust your characters to be lovable without affectations, and trust your readers to be smart enough to hear the accents with only a few prompts. *Or whatever the writer’s native tongue may be. Tell me your opinion: Have you ever written a character who has an accent or speaks a dialect? 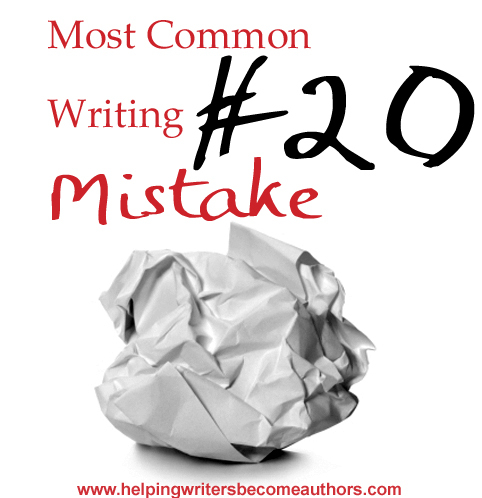 http://kmweiland.com/wp-content/podcast/mistakes-20.mp3Click the “Play” button to Listen to Audio Version (or subscribe to the Helping Writers Become Authors podcast in iTunes). What Should Your Characters Talk About? Thank you for this article. I ran into this trouble. I was concerned that I was making a Russian immigrant’s accent into a caricature. When I knew a lot of Russian immigrants, I noticed that they dropped articles in their speech a lot, (a, an, the). I think in my situation, doing only this is enough to give some authenticity to the character’s voice without making it unreadable. I need to have some characteristic of an accent because his relationships with other characters are problematic because other characters fall for the stereotypes and have negative opinions of him until they get to know him. He is a crime reporter, (not the main detective/narrating character, but a colleague) but he has a strained relationship with the police. I am dealing with this very problem in my YA fantasy fiction. Based in a medieval Russian-type world, all of the characters use the English language, but I use “da” for “yes” and “net” for “no.” I am also planning on using an ancient Slavic language for magical spells. Two very minor characters have a tad more dialect. They use “zat” for “that” and an occasional missed word, because they are common- folk types. It seems to read well without being too distracting. I just hope it’s acceptable to publishers and editors when I submit it. Hello! I know that this post is several years old, but it’s been really helpful to me. If you’re still answering comments, I have a question: If I’m writing a fantasy book that takes place in a different world, how do I convey accents? I obviously can’t say “she spoke with an Italian accent,” since Italy (and all of the countries we know) doesn’t exist in the world of the novel. What could I do, aside from phonetic misspellings, to make it clear what accents certain characters have? I generally just mention that a character spoke in the “accent of the northern region (or whatever), which rounded its consonants”–or something like that. Using words like “brogue” and “lilt” can also be helpful in hinting at a particular kind of accent. I’ve thought of this, too, for one particular character in my fantasy/sci-fi work. I guess the main thing with that one is to mention exaggerated O’s. Very helpful. Writing for a Scottish lass and this really helped me clinch her character. Thank you so much. I had written for Jamaican man in a previous story and an ashamed to say his patois was completely illegible. There really is a delicate balance between linguistic lilt and dialect debauchery. That was Russian. Most of the time something like that is just for color and should be used sparingly, since readers won’t understand it.